If it had happened in any month other than April, 1865, they say, it would be the legendary American disaster every school kid knew about. It would be the subject of folksongs and novels and movies. But it was the month of a Confederate surrender ending our bloodiest war, the month of America’s first and most critical presidential assassination. The month of April, 1865, they say, deadened editors and readers to the horrible news of the riverboat Sultana. That is, at least, the most common explanation for why most Americans have never heard of the worst maritime disaster in American history. In body count, it was deadlier even than the Titanic. In fact, it was deadlier than any shipwreck in the world in the 19th century. Perhaps it was a matter of perspective. Its losses didn’t compare to that of the Civil War’s dozen deadliest battles. Although the Sultana disaster had a death toll less than half than that of Sept. 11, 2001, it came across as a short page-four story in The New York Times. Of course, another problem for publicity, compared to the Titanic, is that the Sultana’s passengers didn’t include the rich and famous. Most of its passengers were recently paroled prisoners of war, Union men who had spent the last several months in Confederate prison camps and were finally on their way home from a war that was blessedly over. And maybe the Sultana’s problem is that it’s too strange to be legendary. That it should happen not on high seas, but on a river within view of both shores—it might be hard to dramatize, at that. Whatever remains of the Sultana is believed to be under layers of silt near the Mississippi River, more than 400 miles away from Knoxville. 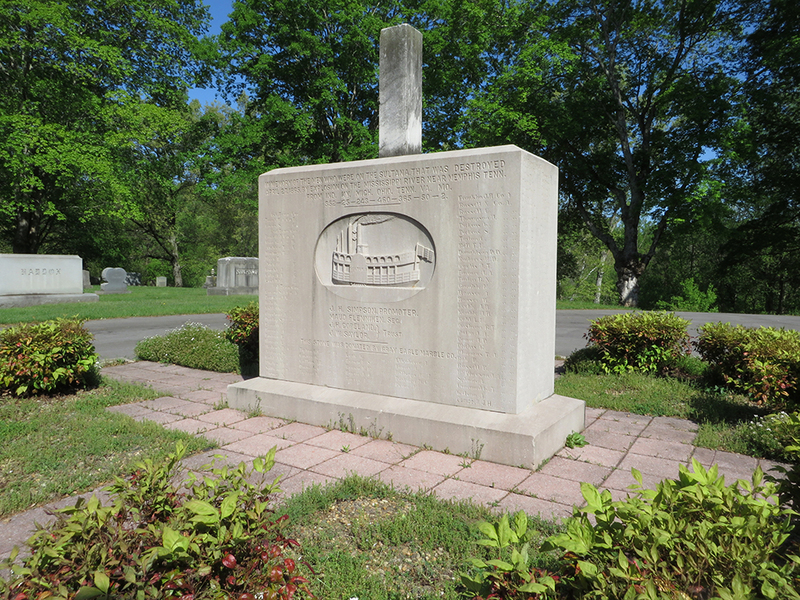 For many years, the only memorial to the Sultana was in a cemetery on Maryville Pike. Even today, it’s reputedly the most impressive one. It’s there because hundreds of the men who died on that boat, and dozens who survived, were on their way to the Knoxville area. By most accounts, almost a quarter of the passengers on the Sultana, and about a quarter of the dead, were members of the Third Tennessee Cavalry, and most of those were from East Tennessee. Of the survivors of that disaster, almost 50 were from one tight population center, composed of Blount, Sevier, and Knox counties. The Tennessee Deaf and Dumb School, currently the Lincoln Memorial University’s Duncan School of Law. The town that soldiers on the deck of the Sultana were picturing as Home was unlike any other. Much more divided than most, Knoxville was neither Union or Confederate, didn’t think of itself as North or South; in fact, whether this compact community of 6,000 was a “city” or not might have been a matter of debate in its oyster saloons. In the 15 years before the war, things were looking up for Knoxville. 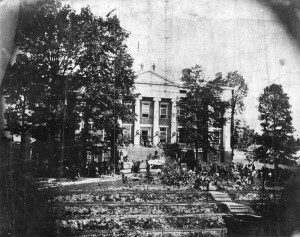 Tiny East Tennessee University on its Hill—which technically wasn’t yet considered part of Knoxville—had fewer than 100 students, and that was before it was shut down and then damaged by shelling during the siege 17 months earlier. ETU had moved in with the Tennessee Deaf and Dumb School, which had some national acclaim, and being a statewide institution—unlike ETU at the time—was a greater point of pride for Knoxville. Still, more exciting to most Knoxvillians was that from 1855 to 1858, Knoxville had finally opened to rail transportation, which meant a lot to prospective passengers but more importantly opened the city to modern industry: coal, marble, iron, lumber. Suddenly there were foundries, machine shops, “floury mills,” breweries, new hotels. Knoxville had just embarked on the first economic boom in its 70-year history when the war hit and knocked the wind out of the town-city. Knoxville was a former state capital, but that was a long time ago, and like a lot of first state capitals who lost state-capital status—like, say, Cahaba, Ala.—it could have dwindled to nothing, even returned to forest. A little more than 300 miles to the southwest, the war was still on in March, 1865 when the Union prisoners at Cahaba found out they were being paroled in a complex prisoner swap. Cahaba was briefly famous as the capital of Alabama, 40 years before, though probably none of its 3,000 prisoners were old enough to have memorized that fact in school. The flood-prone area made it seem a pretty terrible place for a capital of anything. The town was just a remnant when, halfway through the war, Confederate authorities planted the prison camp they called “Castle Morgan” there. It was named for a Confederate leader who had a reputation akin to a pirate—and who was well known in East Tennessee. Alabama-born Gen. John Hunt Morgan was the guerrilla whose unauthorized, reckless raid north of the Ohio River, in the weeks just after the Confederates’ withdrawal from Pennsylvania, gave Confederates a desperate hope. After escaping from prison, the 39-year-old Morgan was planning a raid on Union-held Knoxville—he represented the last Confederate threat to this city—when he was ambushed and killed in Greeneville, Tenn.
East Tennessee connections on both sides in this godforsaken part of southern Alabama made for a little bit of a coincidence, whether the prisoners took note of it or not. Most of Cahaba’s prisoners were former members of the Third Tennessee Cavalry, a U.S. regiment that had been captured in 1864 while trying to relieve a besieged fort in North Alabama. In his famously swift and bewildering style, Confederate Gen. Nathan Bedford Forrest had imprisoned 550 of them. As Confederate-run prisoner-of-war camps go, Castle Morgan was not considered one of the hellish ones, that is, if you could suffer the central Alabama heat. Its death rate was relatively low. Perhaps the worst they had to deal with was another flood, that February. If it wasn’t a good place for a capital, maybe it wasn’t even a good place for a prison. But once they were out, they all had to deal with one absurdity. No matter where home was, these Union soldiers had to go all the way up to Columbus, Ohio, to be mustered out. For the Knoxville-area soldiers at Cahaba, that was twice as far away as home. And to go due north, they had to go due west, to Vicksburg, Miss. There they’d get on a ship for a river trip to the Ohio. The trip back home to Knoxville—which if they took the Tennessee River, would bring them back into Alabama, near where they were captured—would be a roundabout journey of over 1,000 miles. In wartime, you don’t always look for logic. If Third Tennessee soldiers at Cahaba had just broken ranks and deserted, just walked home, it would have been faster, and, as it turned out, safer. But in March and early April, the war was still on, Lee had not yet surrendered, the Confederacy still existed, there was still protocol, and prisoner exchanges had to be handled by the books. That first leg of the trip, just to get on a riverboat, involved marches, steamboats, and trains. It took weeks to get there. Of course, any prisoner exchange seemed almost superfluous. It was clear even to most prisoners that the war was very nearly over. The almost-furloughed prisoners of East Tennessee, expecting the relief of peace, must have found this final, counterintuitive order frustrating. Their homes and families were to the northeast, but freedom meant slogging west, to the big river. The arrangement was to meet at Vicksburg, and wait for the next available boat north. Other prisoners in the deal were from Georgia’s Andersonville. They had a different experience. Cahaba had one of the lowest death rates among Civil War prison camps, Andersonville one of the highest. When the two groups arrived together in Vicksburg, Union officers noticed they looked different—the Andersonville veterans thinner, weaker, sicker than the Cahaba veterans. They all boarded the giant double-decker side-wheeler Sultana, a two-year-old steamboat that had been recruited for military use, steaming swiftly back and forth between Cairo and New Orleans. Steaming north, engineers had noted a problem with the boiler, and at Vicksburg got a local boilermaker to patch it. It was a big ship, 260 feet long, and could carry almost 376 at a time, but by some accounts on April 24, 1865, it loaded more than 2,000 soldiers on board. The federal government was paying by the passenger, so there was a motive to maximize. Plausible scenarios suggest bribery and corruption among riverboatmen and these mid-level federal officers. 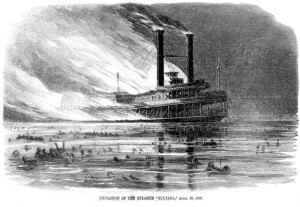 Whatever the total, the Sultana left Vicksburg overloaded several times over its recommended capacity. It caused a strain on the engines. For the next 150 years, people would argue about whether an imperfect patch or the badly overloaded ship were more to blame. A third theory was that a Confederate bomb caused what happened three days later. It’s not as far-fetched as most conspiracy theories, considering there was terrorism in the air that month; it exploded just 12 days and a few hours after a seemingly unlikely conspiracy in Washington resulted in the stabbing of Secretary of State William Seward and the shooting of President Lincoln. When the passengers boarded the ship, John Wilkes Booth was still at large. Maybe, some believe, the explosion of the Sultana was a part of the revenge conspiracy we never learned about. Most historians today believe the culpable parties are the U.S. officers who agreed to put so many men on one ship. Two years of inquests resulted in lots of reasons to be suspicious of dishonest and incompetent officers, with one arrest but no criminal convictions that stuck. That summer, the burned-out hulk of the Sultana, which by some accounts still bore visible bodies, finally sank below the surface, into the muck. Knoxville was almost 1,000 river miles upstream from the Sultana explosion, but became a center for remembering it. From a distance, or on a map, Knoxville, roughly midway between the Confederate headquarters at Richmond and Jackson, Miss., could look like the South. But the Civil War wasn’t really about North versus South. There were thousands more Confederate sympathizers in New York City than there were in, say, Sevier County, Tenn., which is not known to have had any at all. Knoxville had never considered itself part of “the South” until its state, after contentious debate, aligned itself with the Confederacy in mid-1861. And Knoxville had never been very predictable anyway. It would be especially unfamiliar to Hollywood directors, accustomed to picturing the defeated South in a certain way. No one accent would do. In 20th-century Hollywood, every town in the 1860s South was populated by born-and-raised locals who were committed to their grandparents’ land and way of life—and who all spoke with the same Southern accent—interacting with Northern newcomers who were either (A.) greedy, rapacious carpetbaggers or (B.) enlightened tutors of racial equality and understanding. Knoxvillians who fit any of those categories, if they existed at all, were a minority. Most Knoxvillians in 1865 had grown up somewhere else, perhaps far away. The city’s civilians were a promiscuous mixture of ethnic and political affiliations. Hardly any two were identical in their perspective on the war. Few even spoke with the same accent: There were Northern Unionists who had come here during the war, Northern Unionists who had come here years before the war, and Tennessee-born Unionists never tempted by secession. There were Confederates from the Deep South, as well as Tennessee-born Confederates, a few of them wealthy businessmen and large landowners. There were immigrants who spoke more easily in French or German, some of them noncommittal about the war, but surprisingly many of whom, even without deep roots here, had curiously cast their lots with the Confederacy. There were Irish Catholic Unionists and Irish Catholic Confederates who all still wore their accents. 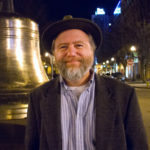 Knoxville was home to Jews who had fought for the Confederacy, and Jews who had fought for the Union. There were Unionists who had started the war as Confederates and Confederates who had started the war as Unionists. There were Confederate wives who were married to Unionists, even Union soldiers. There were Southerners who owned slaves, many Southerners who didn’t own slaves, some Northerners who owned slaves. There were hundreds of freed slaves; there were blacks who had always been free, some of whom, well past 50, were old enough to remember when they could legally vote in Tennessee. There were black soldiers in blue, in active duty, and white soldiers in blue. Some had been in combat, and had been wounded; some had hardly left camp. There were citizens who had helped repel the Union raid in June of 1863, and citizens who had helped repel the Confederate siege in November of the same year. Knoxville was a remarkable city in that regard. And of course there were many mothers and wives who hated all four years of the war, and were glad it was over. Knoxville’s most prominent Confederate was scholar and physician J.G.M. Ramsey. His father was a newcomer from Pennsylvania. He shared a mother with his half-brother, Thomas Humes, who was one of the city’s most dedicated Unionists. Humes’ father was an Irish immigrant. Knoxville’s popular U.S. congressman was Republican Horace Maynard, who was from Amherst, Mass., but who had lived in Knoxville for 30 years. Since long before the war, several downtown merchants were New Englanders, among them Perez Dickinson, cousin of the unknown poet Emily. One of the city’s most prominent stores was E.J. Sanford & Co., run by a 33-year-old carpenter from Connecticut who came to Knoxville the decade before the war. Even though he was married, he had set out to join the Union army, but took ill. He returned to Knoxville and recovered in time to help with the defense of Fort Sanders against Longstreet’s invasion. Pharmacies sold lots of things besides drugs, as they do today, but Sanford took it a little beyond the concept. In April, 1865, he was advertising “choice wines and liquors,” as well as paint, window glass, and a variety of exotic peas. Market Square was there, a farmers’ market in a small one-story brick market house in the middle with some fun stuff along the sides, like Knott’s Bowling Saloon. James Moses, one of the planners of Market Square, was a former Bostonian. But the ever-busier Square was a calculated gift of two young developers who’d been secessionists in 1861. William Swan, a fierce Confederate who served in the Confederate Congress in Richmond, and his partner, Joe Mabry, a provisioner of the Confederacy in its early months who nonetheless offered his help to Union authorities when they arrived. Knoxville’s opinion leader and unlikeliest politician was an awkward fellow originally from Virginia, “Parson” W.G. Brownlow. He had never lived in Knoxville until he was in his mid-40s, but became the city’s most popular and infamous journalist. A pundit known for his extreme opinions and sense of ridicule—was Brownlow our Rush Limbaugh or our Bill Maher?—suddenly became governor of Tennessee at the most critical moment in the state’s history. He’d been such a lightning rod, you’d think he would be incapable of a wise, even-tempered gubernatorial statement, but he enjoyed surprising people. He didn’t trust the new president, his fellow East Tennessean Andrew Johnson. But that April, Brownlow, who had been nationally known before the war for his rhetorical defenses of slavery, moved rapidly and decisively toward emancipation of the slaves and protection of the freedmen. “Let us do our part in this great work by ratifying the action of Congress…. It becomes us … to approach this subject with an enlightened statesmanship, and with a degree of moral courage that is not afraid to do right. Brownlow’s old paper, The Knoxville Whig and Rebel Ventilator, was being run mainly by his son, John Bell Brownlow, named for the famous Whig politician of the 1830s who’d run for president in 1860 as a quixotic peace compromise candidate. Two weeks later, with little narrative, the Whig ran names of the presumed dead of the Sultana, and of the survivors. In the weeks to come, the survivors, exhausted by war, imprisonment, and explosion, perhaps some with skin scorched by the historic catastrophe, would drift back toward the complicated little city on the bluff. At a convention of the Association of Sultana Descendants and Friends in Marion, Ark., a Union reenactor hands a flag replica to Knoxvillian Norman Shaw as part of an 1865-era U.S. Navy Burial at Sea ceremony. Even the Mississippi River forgot the Sultana. The hulk sank beneath the riverbed, and when the Mississippi changed its course, moving to the east, the Sultana’s grave was under dry ground, what’s now a soybean field near Marion, Ark., just north of West Memphis. Last week, Marion hosted a sesquicentennial gathering of Sultana scholars and descendants sponsored by the Sultana Historic Preservation Society, featuring speakers like author and Memphis lawyer Jerry Potter, on his “Search for the Sultana.” Potter announced in 1982 that he had found reason to believe he knows exactly where the Sultana is, but the cost of excavating it is presumed to be prohibitive. A new documentary, Remember the Sultana, narrated by actor Sean Astin, premiered in Memphis. One of last weekend’s events was a “wreath laying,” but it was in a Marion parking lot, not at what’s believed to be the Sultana’s final resting place, which Potter and others would prefer to keep to themselves. Among those who attended was retired Knoxville lawyer Norman Shaw, who 28 years ago played an unexpected role in reviving a very exclusive Knoxville society. Knoxville Sultana survivors in 1920. Pleasant Keeble is at far left; John Simpson is second from right. In his popular history/memoir, Life on the Mississippi, in 1882, Mark Twain made a rueful joke about a steamship whose boiler exploded near Memphis with great loss of life. “Some farmer will turn up her bones one day, no doubt,” Twain wrote, “and be surprised.” Modern reporters like to cite that quote as if it were about the Sultana. In fact, Twain was referring to the Pennsylvania, which blew up in 1858, killing 250—including Twain’s brother Henry Clemens. 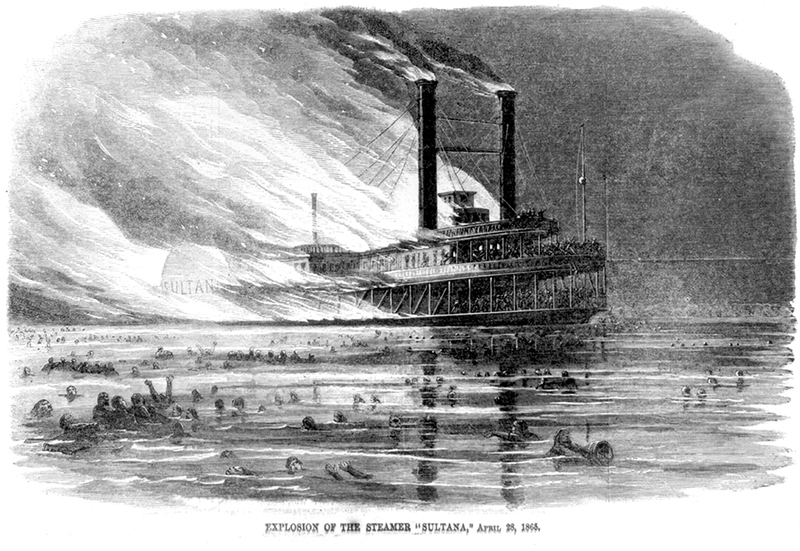 The Sultana wasn’t the first riverboat to blow up near Memphis. Although only a minority of those affected by the disaster were from Knoxville, and even though Knoxville was 400 miles away from the site of it, a few Knoxville-area men were determined the nation didn’t forget it. John H. Simpson was a Knoxville-born passenger, a veteran of combat and of prison camps while he was still a teenager. He was blown from the Sultana, floated downriver until he was picked up by another boat. He made his way back to Knoxville, helped found the local chapter of the Union veterans’ organization known as the Grand Army of the Republic, settled in Vestal, and made a career for himself as a building contractor in the rapidly growing city, but the Sultana became his life’s governing principle. By 1889, Simpson, then in his 40s, had started convening Sultana reunions in the Knoxville area, mirroring a similar effort in Ohio, the only state that lost more men to the disaster than Tennessee did. The Ohio survivors sought federal funding for a major monument to the Sultana, perhaps in Washington. It was, as one supporter lamented, met with “cold indifference” on the part of one Congress after another. If a general had been among the dead, it was implied, it would have happened. But the Sultana’s dead were mostly young enlisted men. The fatal explosion was only occasionally written about, and every time, it seemed, presented a different number of the total killed on the Sultana. One low estimate cited as late as 1920 was 1,238. It climbed as the years went by, as more research was completed, and lists of soldiers compared. Some official sources settled on 1,547 killed. The number 1,700 became more typical, later estimates that include those who died later in hospitals make it as high as 1,800. Republican U.S. Congressman Henry Gibson, of Knoxville—a Union veteran, himself—introduced a bill in 1896 to improve veterans’ benefits for the Sultana’s survivors and their families, but it apparently died in committee. Attempts to at least put up a big monument in Washington or Memphis went nowhere. By the early 20th century, the Sultana’s survivors saw their ranks thinning. As the world was abuzz about other deadly maritime disasters—the Titanic, followed by the Lusitania—it all seemed to suggest some urgency to making a permanent gesture people couldn’t forget. Of the Sultana survivor groups, the one in East Tennessee seemed the most vigorous, and most ambitious. The dwindling number of gray-haired survivors—by then, all were all pushing 70, or beyond—got together and, without waiting for government help, established a permanent memorial. Simpson was a member of Mount Olive Baptist Church. He picked that church’s hilltop cemetery as the site, and it was his prerogative. But it was a pretty good place anyway, a pretty, quiet spot barely within view of an important road, Maryville Pike. And it was easier for Blount County’s several Sultana survivors to get to than it would have been if it were in the middle of town. They hauled a large, oblong block of pink marble, donated by Dale Avenue marble producer Gray Eagle. It was hand-carved with almost 400 names of the Tennesseans aboard the Sultana, whether they survived that April or not. Among the names are those of familiar Knoxville-area families: Huffaker, DeArmond, Cowan, Atchley, Maples. That list is an impressive feat of carving in itself. But what you notice is an idealistic view of the Sultana in bas relief, under full steam, its smokestacks smoking, but unexploded. No crowds jam its decks, as they do in the only known photograph of that voyage. 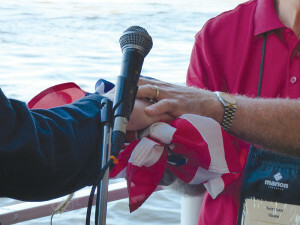 But a giant U.S. flag, out of scale with any real flag behind an ordinary steamboat, floats off the stern. Rarely mentioned is the sculptor who carved the bas-relief, but it was obviously a pro. One likely suspect is a young Italian named Albert Milani (1892-1977), who had arrived in town around 1911, in time to help decorate the facade of the 1912 Holston Building on Gay Street. Knoxville’s busiest stone carver for most of the 20th century, Milani often worked with pink marble, later carving the eagles on the post-office building on Main Street, and the famous Kreis Indy race-car monument in Asbury Cemetery. 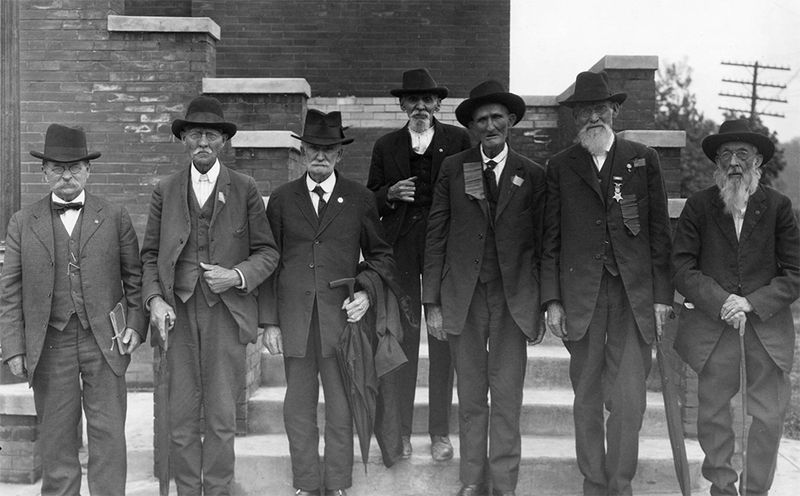 Dozens assembled there, on July 4, 1916, old men in then-unstylish beards and hats, but also with children, perhaps grandchildren or even great-grandchildren, with flags flying, to unveil their monument, Knoxville’s last new monument to be witnessed by actual Civil War veterans—just as their nation tried to stay out of another war. Norman Shaw believes the odd mast structure on top of the main block was added later. It’s cut from a different kind of marble. Most speculate it was an awkward later addition, intended to represent a smokestack. It screws off. The survivors got together every year in April, not always at that site, but often at a church, a little farther out in the country, perhaps a compromise with the survivors in Blount County. But of course their numbers dwindled. In 1921, as Knoxville launched its first radio station, there were 14 of Tennessee’s Sultana survivors left. Two years later, there were reportedly just five. In 1928, as the Tennessee Theatre was completed, there were so few they formally asked the young veterans of the Spanish-American War to take over. Everyone was agreeable then. As it happened, the last two Tennessee survivors of the Sultana disaster were both Vestal residents. John H. Simpson, who had led the push for the monument, and Pleasant M. Keeble, who often served the organization as scribe. The two who lived closest to their monument were the last to see it. Simpson, with the kind face and flowing white beard, died first. Pleasant Keeble, who wore an old-fashioned walrus mustache and still had some dark in his hair, seemed made of iron cable. He decided no further reunions need occur, that the tradition would die with him. And he died in 1931, the year Knoxville completed the new Henley Street Bridge, which for most of us is the handiest way to get to Maryville Pike and Mount Olive Cemetery. 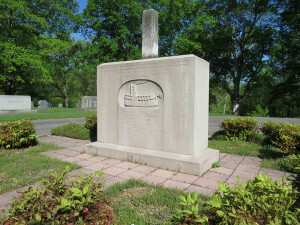 Erected by survivors of the disaster, this unique Sultana monument has stood in the middle of Mount Olive Cemetery, off Maryville Pike, since 1916. The memorial at Mount Olive is, in both tonnage and artistry, one of Knoxville’s most impressive war memorials. Shaw, who’s not a Sultana descendant, attended a regular meeting of the Knoxville Civil War Roundtable, the nonpartisan historical group, in 1987. Shaw was surprised to encounter a Mrs. Malcolm Bloom. She was the daughter of Pleasant Keeble. She was in her 90s at the time and visiting the Roundtable to raise awareness. She mentioned, in particular, the Sultana memorial off Maryville Pike. “She told me about this beautiful monument in South Knoxville which I’d never seen, didn’t even know about!” he says. 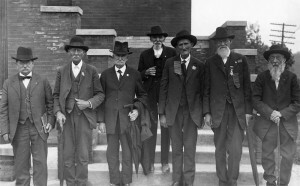 With the help of News Sentinel writer Fred Brown, whose public call for Sultana descendants to convene at the memorial was answered by 50 who showed up there at the appointed time on a Sunday afternoon, encouraged Shaw to believe there was hope for reviving the old Sultana reunion that had ceased in the early 1930s. Further newspaper work disclosed eight people who claimed to be children of Sultana survivors. They organized the Association of Sultana Descendants and Friends. Today, they’ve got at least 184 members, most of whom are blood descendants of men who were aboard the Sultana that night 150 years ago. They meet once a year. Earlier this week, author David Madden, who has become a champion of the memory of the Sultana, referred to Shaw and his group in a column in The New York Times, with a mention of Mount Olive’s “impressive monument.” This Sunday’s re-dedication of the Sultana monument may be its passengers’ last and best shot at immortality. 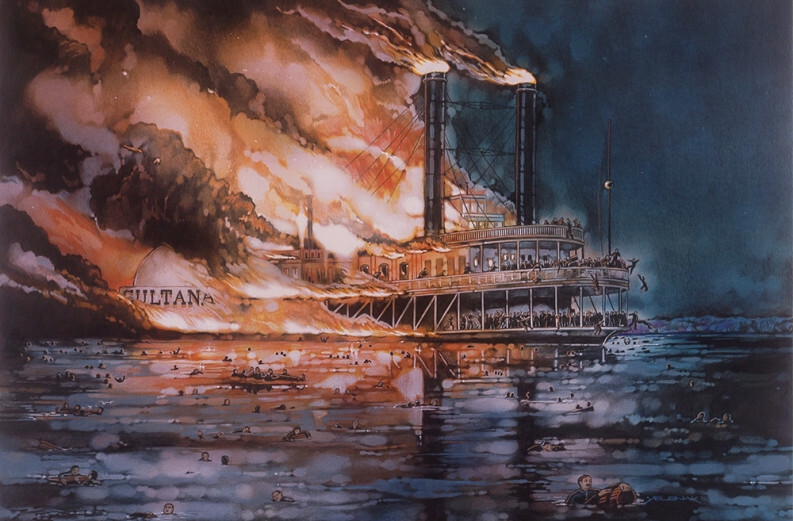 About This Story’s Artwork: The sinking of the Sultana was the impetus for the founding of the Hartford Steam Boiler Inspection & Insurance Company, which originally commissioned (and provided) our cover painting of the fateful event.